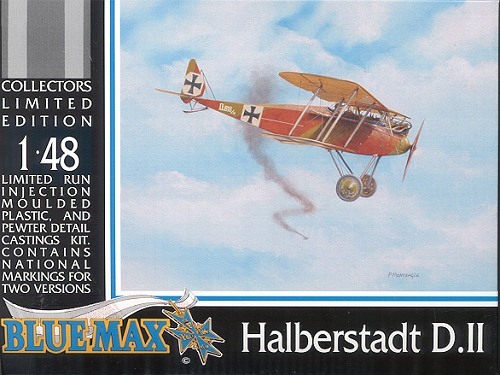 Developed from the B.II trainer, the Halberstadt D.II was a development of the D.I, Germany's first biplane fighter. Powered by an early 120 hp Mercedes six cylinder engine and armed with but a single gun, the D.II arrived on the Western front just days after the death of Max Immelmann in June of 1916. This new plane was a huge improvement over the types then in service and by later in the year was firmly established as one of the types to have. This despite competition from the Albatros D.II and Fokker D.III. However, fame is fleeting in WWI aviation circles and by the spring of the next year, it had been seriously outclassed by the Albatros D.III so was relegated to the Turkish front and trainings schools. Upon opening the box. 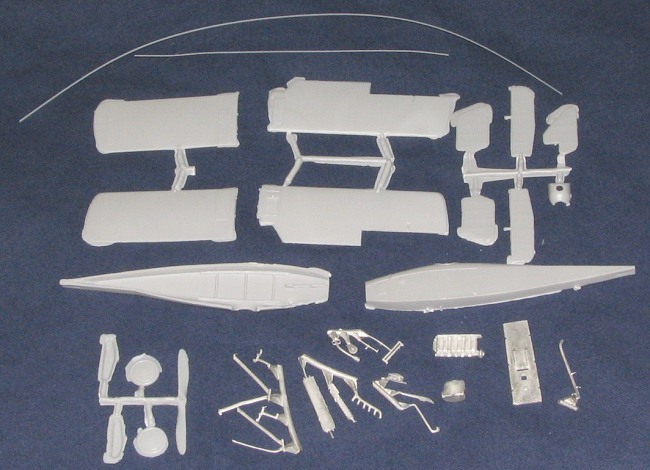 one is greeted by several sprues of low pressure injection molded plastic, a bag of metal parts and two sections of strut material. Though a new modeler may look upon all the flash with apprehension, it really is nothing new to the experienced modeler; the target market for these short run multi-media kits. Clean up is a requirement of these kits and is something that is done rather quickly in most cases. The parts themselves are well molded with good detailing. A rather complete interior is provided with most of these parts in cast metal. A very nice metal and plastic Mercedes engine is also provided. The upper wing has separate ailerons as well so you can position all the control surfaces off neutral if you desire. Instructions are well done with several photos of the completed model as well as the layout of the interior and engine mounting. An exploded view is all that is really needed in terms of how the parts go together. Cutting guides are provided for the strut material. Quite a bit of interior and exterior color info is provided for the two aircraft on the sheet. Both are really quite similar and really differ only in serial, as the very colorful planes we normally associate with German WWI types were not until later. These are basically red-brown and olive green over unbleached linen. Decals are well printed and glossy. Overall, a nice kit that will be something that WWI modelers will be interested in. It is definitely not for the beginner, but those who are able to handle the usual work involved in limited run kits will find this one to be a nice addition to their collection.